The following information is offered by Dave Gobis, Executive Director of the Ceramic Tile Education Foundation. • interior—20' to 25' in each direction. • exterior—8' to 12' in each direction. • interior tilework exposed to direct sunlight or moisture—8' to 12' in each direction. • where tilework abuts restraining surfaces such as perimeter walls, dissimilar floors, curbs, columns, pipes, ceilings, and where changes occur in backing materials. Not at drain strainers. • all expansion, control, construction, cold, and seismic joints in the structure should continue through the tilework, including such joints at vertical surfaces. • joints through tilework directly over structural joints must never be narrower than the structural joint. • interior for quarry tile and paver tile—same as grout joint, but not less than 1/4". • interior for ceramic mosaic tile and glazed wall tile—preferred not less than 1/4", but never less than 1/8". • tile edges to which the sealant will bond must be clean and dry. Sanding or grinding of these edges is recommended to obtain optimum sealant bond. • primer on these tile edges is mandatory when recommended by the sealant manufacturer. Care must be taken to keep primer off tile faces. • backup strip shall be a flexible and compressible type of closed-cell foam polyethylene, butyl rubber, or open cell and closed cell polyurethane, rounded at surface to contact sealant, as shown in details above, and as recommended by sealant manufacturers. It must fit neatly into the joint without compacting and to such a height to allow a sealant depth of 1/2 the width of the joint. Sealant must not bond to the backup material. • suitable sealants include silicone, urethane, and polysulfide. Generally, urethane sealants are recommended for exterior vertical tile surfaces and both exterior and interior horizontal tile surfaces, including tiled traffic areas. Sealants in traffic areas require a Shore A hardness of 35 or greater. • silicone sealants may be used on both exterior and interior vertical tile surfaces. 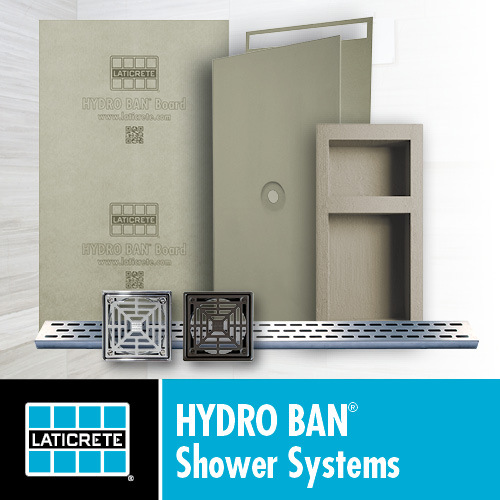 Single-component, mildew resistant silicone sealants are formulated with fungicide for sealing interior joints in ceramic tile showers, and around tubs, sinks and plumbing fixtures. • Grade P—sealants for joints on horizontal surfaces. • Grade NS—non-sagging sealants for joints in vertical surfaces. • Class 25 and 12½—identifies sealants which can withstand an increase and decrease of +/-25% or +/-12½% of joint width. • Use T—use in joints subjected to pedestrian and vehicle traffic. • Use NT—sealants for non-traffic exposures. • Uses M and G—sealants that will remain adhered to mortar (M) and glass (G) are suitable for use with tilework. • some sealants require edge priming. Consult manufacturer's specifications. • manufactured/preformed joint profiles are available. Consult manufacturer. • cold joints are formed primarily between slab pours where the size of a concrete slab may be too large to be poured at one time. The remainder of the slab would be poured at a later time, forming a cold joint between the two sections. Such joints should be shown on architectural drawings. • a cold joint becomes a weakened joint that, upon movement, will crack, permitting leakage or buckling and cracking of a tile floor set over the slab. • some large slabs on-grade are poured monolithically, then later sawcut at intervals, providing control/contraction joints to allow for cracking at these weakened points. • movement joints in tile should be located over all cold joints and sawcut control joints. • joints in tile and setting materials shall never be less than the width of the saw-cut control joint width. Preparation and installation shall be as required for movement joints. • to insure that location of joints in tilework align with existing joints in substrate, joints in tilework should be constructed during installation of mortar beds and/or tile, rather than saw-cutting joints after installation. • keep movement joint cavities open and free of dirt, debris, grout, mortar, and setting materials. • set compressible backup strip when mortar is placed or utilize removable wood strip to provide space for backup after mortar has cured. • install sealant after tilework and grout are dry. Follow sealant manufacturer's recommendations. • refer to sealant section in ANSI tile installation specification. NOTES: Preparation of openings left by the tile contractor and installation of backup strip and sealant should be specified in the Caulking and Sealant section of the job specification. The performance requirements of certain special locations, such as exterior swimming pools, dairies, food plants, etc., may exceed the minimum requirements of the sealant specifications given above. Therefore, follow recommendations of experienced manufacturers as to specific sealants suitable in the job environment. In some severe environments, a program for regular maintenance of sealant in joints may be required. Last edited by Mike2; 03-13-2007 at 11:42 AM. Reason: Updated content using 2005/06 TCA Handbook material. Sorry for the delay, sometimes things come up. Here is my long winded response, probably more than you ever wanted to know on the subject. The urethane referred to for expansion joints is a type of caulk. It's usually in the caulk aisle, but I have seen it in the professional contractors section of some stores, or it'll be near the concrete stuff. Urethane caulk suitable for floors will be marked with minimum Shore A Hardness 35, which denotes traffic grade sealant. You may find it in large 30 oz. cartridges, which are usually pourable/self-leveling versions. Unfortunately, your chances of finding it in anything close to a red are pretty unlikely. Limestone or gray are pretty much the standard colors available in traffic grade sealants. Now, if you're willing to venture beyond the local big box store, you can probably get a urethane in a red color. There are two part urethane caulks available in almost any color you want. Some manufacturers will even color match for you, never hurts to ask. The supplier carries the main unit, (base and catalyst) and stocks color packs for the most common colors. They can usually can get a color pack for unique colors on short notice. (A color pack is usually about 4-8 oz. of a special pigment that is added when the whole thing is mixed up.) Typically, these units are one and a half gallons of mixed material. You have to mix the whole unit at once, there is no measuring out partial units. A unit this size will probably do a couple hundred feet of joints that measure 1/4" x 1/4". My local yellow pages has a heading "Caulking Materials and Equipment". You can also check under "Contractors Equipment and Supplies", or "Concrete Accessories". Sometimes ready mix concrete suppliers carry these sealants. Wherever you get the caulk will also carry the backer rod you'll need. Between the yellow pages and the web, you shoudn't have any trouble finding a source of supply. The "compressible backing strip" is more commonly called backer rod. It is usually in the the caulk aisle as well, sold in a small coil in a bag. It's kind of like a foam rope that is put into the joint so you don't use too much caulk. There are different diameters available, and two types. There is open cell foam, often called "denver foam, and is a lot like the foam used in a furniture cushion. If you can stuff a 1" diameter piece of denver foam into a 1/4" joint, it'll work fine. Open cell works great for indoor use, and if you cut it or tear it while your installing it, it won't matter. Open cell foam will wick water, so it is usually used indoors and occasionally on vertical applications. Closed cell foam does the same thing, but is a little more unforgiving when you install it. The "closed cells" contain nitrogen gas, and if you pierce the cells and then caulk, the gas works it's way to the surface and causes bubbles in the surface of the caulk. The same thing happens of you try to compress too large a diameter rod into a joint too small. Buy closed cell foam close to the size of your joint as possible. Closed cell foam won't wick water, so it is often used on horizontal surfaces. If the caulk is damaged, the closed cell foam acts as a secondary water stop. You want to make sure that you have backer rod in every gap where you're going to pour in sealant, other wise the sealant will flow through or beyond any gaps. And it's a real PITA to clean up if it goes where you don't want it to go. 1. You can probably get the color you want. 2. You can get this caulk in a pourable, self leveling formula, which will go in a lot faster, and will cure a lot faster than a gun grade material. Install the backer rod, mask all of the joints, mix the caulk, pour it into the joints. Tooling is a lot easier and faster too. To make pouring easier and more precise, bend a small coffee can to create a spout, and pour from that. I think that's a lot easier than crawling around with a caulking gun. 3. You'll get a joint that is tough enough for a shopping mall floor that will last many years without tearing or shrinking, in a color you wanted, not one you settled for. Some of the brand names you might look for are Tremco, Vulkem, Sonneborn, Sika, or Bostik Chem-Calk. They're all good ones.